Second-placed Linfield will need to win at Cliftonville for the second time in a fortnight to keep up the pressure on Irish Premiership leaders Crusaders. 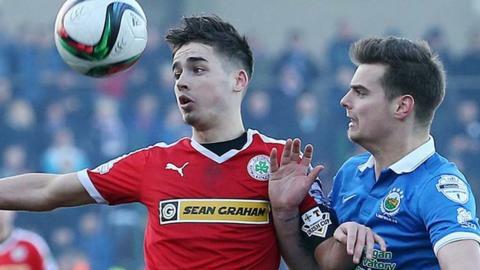 David Healy's team won 3-0 at Solitude in the Irish Cup quarter-finals and last weekend beat Glentoran to close the gap at the top to five points. Crusaders have a game in hand but Healy insists the champions can be caught. "We can do it - as long as the players believe in themselves as much as I do," said the former international striker. Linfield will have defender Jimmy Callacher and striker Paul Smyth back in their squad after suspensions. Cliftonville's sights now seem to be on securing a second-place finish as their title hopes have faded after taking just four points from their last four fixtures. "It is all down to us in what is a massive game for everyone involved," said Cliftonville manager Gerard Lyttle. "Losing to Linfield in the Irish Cup was a huge disappointment for us and hopefully we can put things right on Saturday. "That cup defeat was not the end of our season - we have plenty to play for in our remaining Premiership fixtures." Crusaders' charge towards a second successive title has lost some momentum with six points being dropped in three recent drawn games. On Saturday's Stephen Baxter's side take on one-from-bottom Carrick Rangers who are desperately trying to climb out of relegation trouble. "We haven't been beaten, but I would rather we were winning," said Baxter whose side drew 0-0 at home to Ballymena last time out. Former Linfield manager David Jeffrey's first home match as Ballymena boss is against bottom-placed Warrenpoint Town. "It is important we play with the same work rate, discipline and attitude as we did against Crusaders," said Jeffrey. "Warrenpoint have been phenomenal since the new year and will fancy their chances of beating us."